Honoring Choices® Pacific Northwest, a collaborative initiative between physicians and hospitals, has partnered with national leader Gundersen Health to bring evidence-based advance care planning training directly to physicians, hospitals and communities to ensure they are prepared to discuss and honor patients’ wishes. Under the new partnership, Honoring Choices Pacific Northwest will implement Gundersen’s widely-acclaimed Respecting Choices® advance care planning curriculum used in more than 120 medical systems across the country to design a training program for use in health care organizations around the region. Honoring Choices Pacific Northwest will introduce the program within a number of health care organizations in Washington in the next few months, and intends the training to spread to multiple organizations and communities over the next several years. Learn more about the Honoring Choices Pacific Northwest program at www.HonoringChoicesPNW.org. For more information, please contact Jessica Martinson at jessica@wsma.org or Carol Wagner at carolw@wsha.org. 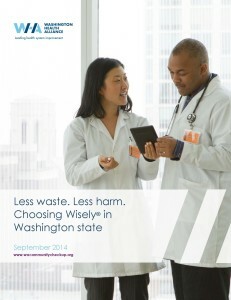 Join health care leaders, stakeholders and national Choosing Wisely® representatives on Friday, Oct. 30 for Improving Value in Health Care: The Choosing Wisely Summit, a day-long, in-depth look at how the Choosing Wisely initiative in Washington state is moving from education to implementation. 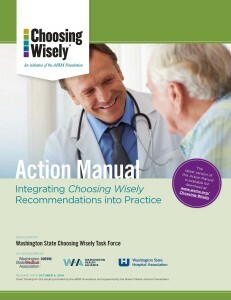 In his keynote address, Daniel Wolfson, executive vice president and COO of the ABIM Foundation, will discuss why having an implementation plan in place is important and how to adapt and utilize the steps outlined in the Choosing Wisely Action Manual, created by the Washington State Choosing Wisely Task Force. Dr. Matt Handley from Group Health and Drs. Norris Kamo and Kim Pittenger from Virginia Mason will discuss their health systems’ success with integrating Choosing Wisely and how they did it. Attendees can choose between afternoon breakout sessions on subjects such as integrating Choosing Wisely into your EMR, risk management, quality improvement and measuring performance, implementing Choosing Wisely in different practice settings and more. If your practice or clinic is ready to integrate Choosing Wisely recommendations into daily operations, this conference will give you the tools and inspiration to implement change within your care setting. If you’d like more information about the summit or how to integrate Choosing Wisely into your organization, please email Jessica Martinson at jessica@wsma.org. Pharmacists and physicians play a key role in Antimicrobial Stewardship (ASP) – using the right antibiotic at the right time and only when necessary. Through a Statewide Antimicrobial Stewardship Initiative, the Washington State Hospital Association, the Washington State Medical Association healthcare providers and organizations are joining forces to find innovative strategies for more judicious use of antibiotics and to prevent the emergence of drug-resistant organisms such as Clostridium difficile. The statewide Antimicrobial Stewardship Initiative is a collaboration, including the Washington State Department of Health, the Washington State Pharmacy Association, Qualis Health, and the Antimicrobial Stewardship Consortium of Washington. Over 60 hospitals are actively engaged in the collaborative. The participants gather monthly via webcast to share and discuss data, identify opportunities and barriers in order to work together and move forward as a state. Antimicrobial Stewardship Programs in every hospital and health system. Every Washington hospital achieves Tier 1 antimicrobial stewardship programs by the end of 2015. Create vehicle to collaborate within communities to optimize antibiotics usage. Reduce antimicrobial use in select antibiotics. Reduce Clostridium difficile by 10% in Washington State by the end of 2015. The National Action Plan to Combat Antibiotic Resistant Bacteria is an Executive Order that was released in March 2015 by the White House, indicating that all hospitals will be required to have robust antimicrobial stewardship programs by the end of 2016. Washington state is making a concerted effort to meet the regulatory and data submission requirements, but patients and healthcare facilities need hospital leadership to prioritize this important patient safety issue. Through a committed quality and leader focus on antimicrobial stewardship, in conjunction with healthcare teams across the state, Washington will effectively continue the fight against antibiotic resistant bacteria — both a costly and deadly battle that needs to be urgently addressed. For questions regarding this initiative, please contact Meg Kilcup. For more information, please visit the Antimicrobial Stewardship homepage. The Washington State Choosing Wisely Task Force is also dedicated to reducing over-prescription of antibiotics through its “Change Three Things” strategy. 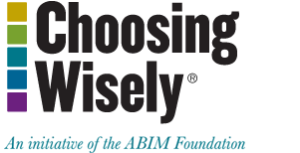 Washington state is one of seven communities in the country that received a collaborative grant from the ABIM Foundation and Robert Wood Johnson Foundation to support the implementation of Choosing Wisely within health systems. One key goal of the grant is to reduce the prescription of antibiotics for viral infections by 20% by May 2018. For more information about these efforts, please contact Jessica Martinson at jessica@wsma.org. Hospitals in Washington State have the opportunity to earn a one percent incentive payment under the Medicaid Quality Incentive Program if performance is at or above the benchmark. The Medicaid Quality Incentive program measures are evidence based, significant in improving quality of care and are collected for all patients regardless of their insurance. This effort is in alignment with quality and patient safety projects that Washington hospitals are already working on. Non-critical-access acute care, pediatric, and rehabilitation hospitals are eligible to participate and expected to collect data and make improvements which support improving care for all in Washington. All hospitals, including critical access hospitals, with “perfect scores” will earn recognition. The data collection period is July 1, 2015 – December 31, 2015. The areas of focus are reducing hospital acquired infections, falls with injury and readmissions, in addition to ER is for Emergencies, safe deliveries and behavioral health. For a complete description of the measures, please go to http://www.wsha.org/qualityincentive.cfm. For questions, please contact Carol Wagner at carolw@wsha.org or (206) 577-1831. In 2014, a law supporting the transformation of the health care delivery system and improvement of purchasing accountability was passed in Washington. The Governor appointed a 34-member Performance Measurement Coordinating Committee (PMCC) to recommend standard statewide measures of health performance which would inform purchasers and enable identification of benchmarks against which to track costs and improve health care outcomes. Washington State’s “starter set” of 52 core measures was approved in December 2014. 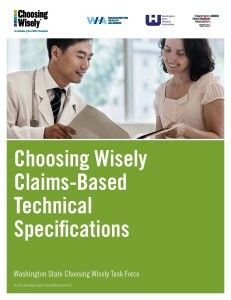 The criteria for measure selection included: preference for nationally vetted measures and alignment with national measure sets; based on readily available health care insurance claims, survey and clinical data to enable timely implementation; reflect areas of health and health care thought to have a significant impact on morbidity, mortality, disability, health equity and quality of life; and reduce costs over time. After the first year of reporting results for the initial Statewide Core Measures Set, the Health Care Authority and PMCC will review reported performance outcomes and replace or retire core measures, based on the goals of state purchasers and a high priority development list. Prevention − The measures are in the primary care and population health domain, focusing on Adult Screenings, Behavioral Health and Depression, Childhood: Early and Adolescents, Immunizations, Nutrition, Physical Activity, Obesity, Obstetrics, Oral Health, Safety and Accident Prevention and Tobacco Cessation. Chronic Illness − The measures are in the primary care and population health domain, focusing on Asthma, Care Coordination, Depression, Diabetes, Drug and Alcohol Use, Functional Status, Hypertension and Cardiovascular Disease, Medications and Patient Experience: Outpatient. Acute Care − The measures are in the acute and specialty care domain, focusing on Avoidance of Overuse and Potentially Avoidable Care, Behavioral Health, Cardiac Care, Cost and Utilization, Readmissions and Care Transitions, Obstetrics, Patient Experience: Inpatient, Patient Safety, Pediatrics and Stroke. This measure set will change over time as evidence, measurement capability and nationally vetted measures evolve. More important, however, is the continued collaboration between providers, hospitals, health systems, public health, communities and payers, working together to achieve healthier outcomes for all Washington residents. For more information, please visit http://www.hca.wa.gov/hw/pages/performance_measures.aspx or contact Carol Wagner at carolw@wsha.org or (206) 577-1831. This entry was posted in Leadership Pulse and tagged advance care planning, Choosing Wisely, Honoring Choices Pacific Northwest, Medicaid Quality Incentive Program on August 13, 2015 by Jessica Martinson.